Pretty Collingwood is a great base for exploring the Golden Bay area. Originally known as Gibbstown, after William Gibbs who bought the peninsula from local Maori in 1855, the settlement grew after gold was found in the Aorere River, prompting a gold rush. A fire destroyed the shanty town and the new settlement of Collingwood was conceived. Grandiose plans were drawn up in London and authorised by Thomas Brunner in Nelson, though most of the town was never built because the gold rush petered out. Collingwood continued as a port, shipping out timber, flax, iron, and coal before another devastating fire destroyed the town in 1904. It was rebuilt but remains a small township. Intrigued by stories of gold mining, we drove out to Rockville. Just past the Devil’s Boots—limestone formations so named because they look like gigantic upside down boots—we found the start of the Aorere Goldfields walking track. This trail loops through the old gold mining area, past two large caves to Druggan’s Dam. Walking through tall manuka scrub, it was easy to imagine the hopeful miners, gear loaded on bullock drays, passing along the same tracks. More than 2000 men flocked to the valley between 1856 and 1859, though we had the track to ourselves for our walk. We checked out Stafford’s Cave (though we gave the rope leading down into the depths a miss) but further on found the Ballroom Cave more accessible. This large cavern was full of stalactites and reputedly used by the miners for dances. I can’t imagine there were many women on the goldfields, so the men must have danced together. Pondering on the strange lives these men led, we continued our walk to Druggan’s Dam. This was constructed in 1900 to provide water for gold sluicing but little was found. It was a nice place for lunch though. Driving further up the Aorere Valley, we stopped to experience The Langford Store. A reminder of the past, this store is part museum, part art gallery, and part cafe. It has been run by four generations of the same family since its opening in 1928 and still operates as a post office and general store. We enjoyed espressos served in bone china cups after browsing the memorabilia and artwork. Further down the valley, we visited the quirky gardens and furniture-making studio at Weka Workshops (just by the yellow ‘look out for weka’ road sign) before reaching the end of the road and the start of the Heaphy Track. This multi-day, 75km-long trail passes through rugged terrain and deep bush before emerging north of Karamea on the West Coast. Golden sandy beaches were calling us, so we drove north to Cape Farewell. 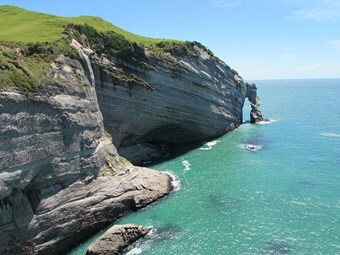 Named by Captain Cook as he left New Zealand in 1770, Cape Farewell is the most northerly point of the South Island. The adjacent Farewell Spit is the longest sandspit in New Zealand and home to a wide variety of birdlife. It is a protected bird sanctuary and access is restricted. Those wishing to travel along the spit can take a 4WD eco tour bus from Collingwood. 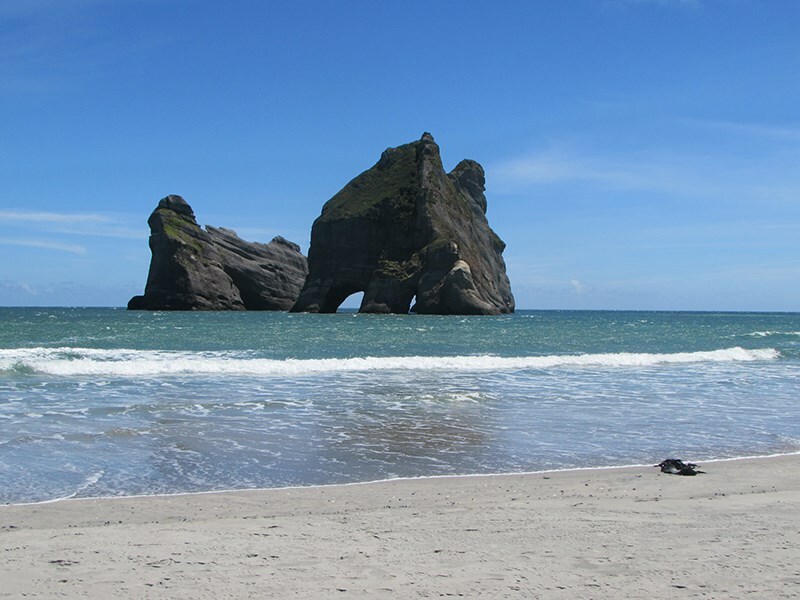 We walked across the sand dunes to Wharaiki Beach where we admired the Archway Islands, pierced by caves, tunnels, and the arches that give them their name. There were plenty of tourists enjoying the sights in this area but we found the pretty beaches just off the road to the north and south of Collingwood almost deserted. We were lucky to be staying at an NZMCA Park Over Property—a farm at Opou, just a dot on the map. 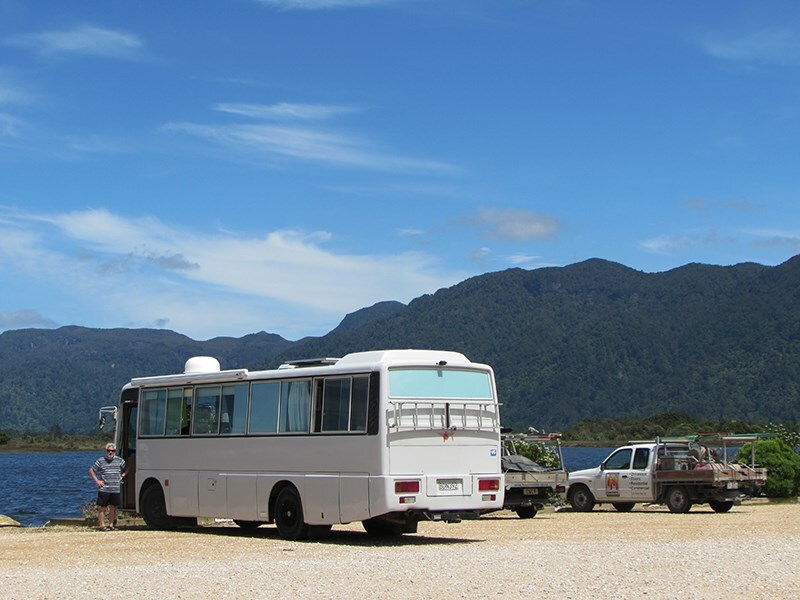 Our bus was parked beside a beach and we were able to walk down the peninsula with the ocean on one side and the Ruataniwha Inlet on the other until we reached the point opposite Collingwood. There was not a soul in sight. Another morning we went to Milnthorpe on the north side of the Parapara Inlet. From the old wharf on the estuary, there is a pleasant bush walk to the beach, which stretches north to Collingwood. It is a 40-minute walk up the beach and it is possible to return on a track through Milnthorpe Park, though there is a labyrinth of tracks in this bush area and the likelihood of getting lost without a map wasn’t appealing, so we stayed on the beach. Parapara, on the south side of the inlet, is a seaside settlement with another picturesque golden beach. Eventually, we headed back towards Takaka Hill and the tortuous, steep, and winding road that separates Golden Bay from Tasman Bay and the Nelson area. Firstly, we spent some time browsing the art and craft shops in Takaka before checking out Te Waikoropupu (Pupu) Springs. 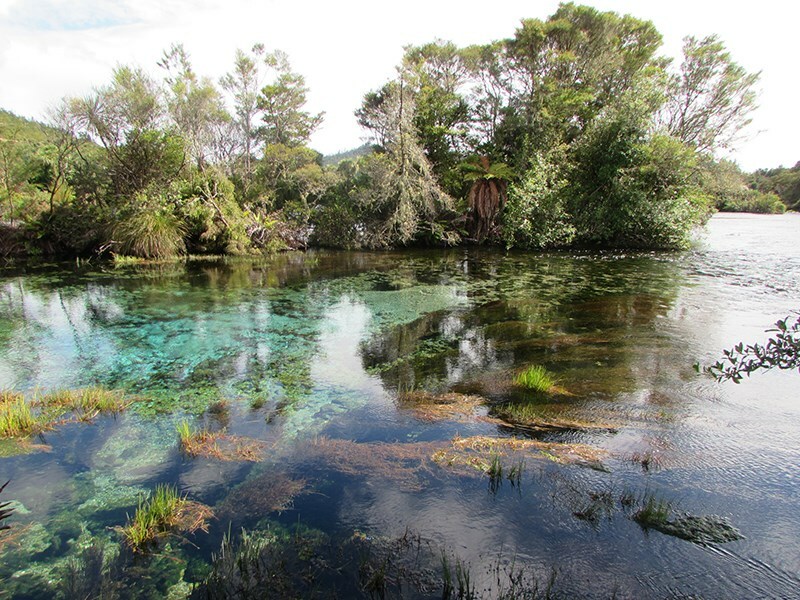 These are the largest freshwater springs in the country, discharging 14,000 litres of water a second. It is surprising that the pools are so still, clear, and deep. Our bus laboured up Takaka Hill, negotiating bends—the hairpin at Eureka Bend is particularly tricky—but we finally reached the summit. We had one last stop here at Ngarua Caves. The caves in the Aorere Valley had whetted our appetite for things speleological, and we were intrigued to hear that there were moa bones in this one. And indeed there were several different skeletons arranged where they were found. Our guide gave us a bone to hold; it was surprisingly heavy. He also turned out the lighting and it was completely dark in the cave. This explained how the creatures that fell in through potholes could never find their way out. After 45 minutes, we climbed up a ladder back into the sunshine. 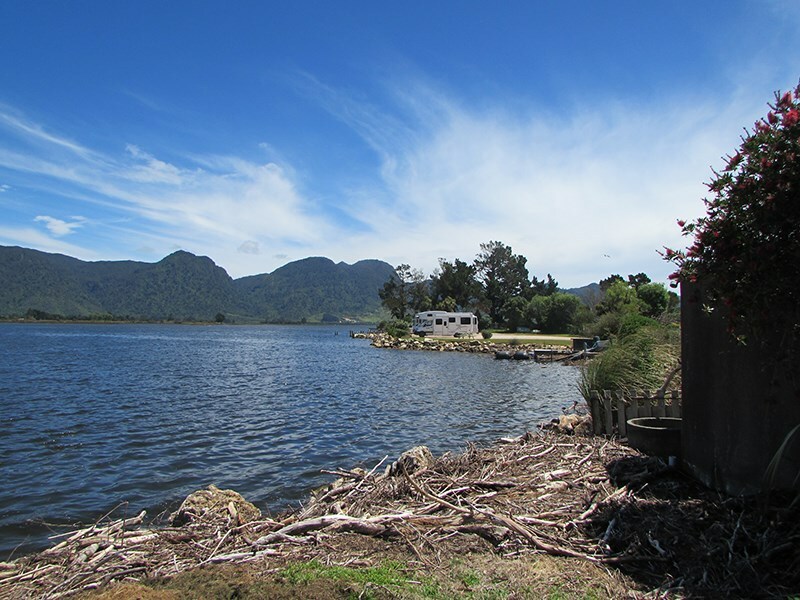 We turned the bus downhill towards Motueka and bid farewell to gorgeous Golden Bay.